Yeesh. 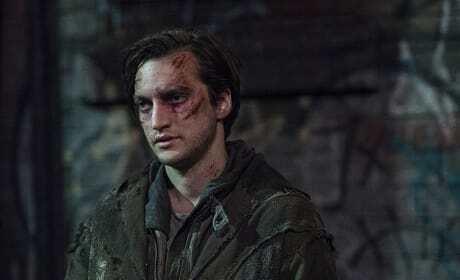 Murphy's looking worse for wear, after his brutal torture at the hands of Titus. 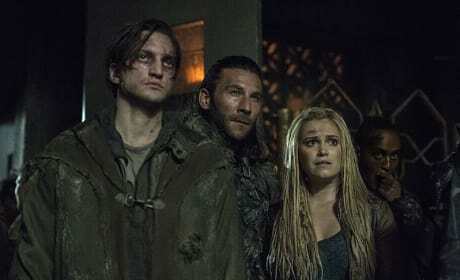 At this point, he is the single character who knows more than anyone else about the connection between Polis and Polaris, and about the connection between ALIE 2.0 and the Grounders' Commanders. What a long way he's come since his violent, villainous days of season one. 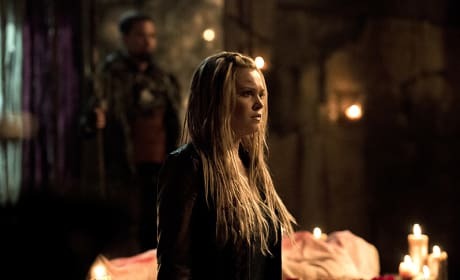 Unsurprisingly, Clarke isn't looking too thrilled to be dealing with a ceremony centered around the recent, grisly death of her beloved Lexa. Plus, last we saw, she and Murphy seemed to have been trapped at Polis by Titus when he locked them in her room after removing the Commander's dead body. 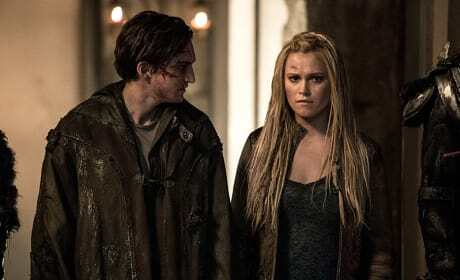 Well, Roan is literally to Clarke's back, which would seem to suggest he has her back in a figurative sense. Then again, we're not really sure where his allegiances lie. He's been gone for several episodes and though he was clearly Team Lexa the last time he saw her, who knows what may have changed in the interim. Titus is looking mighty uncomfortable at this ceremony. Are the people at his back with him or against him? 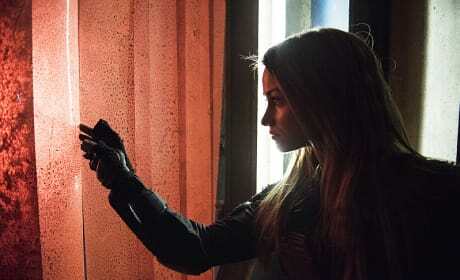 Will he face any retribution or consequences for Lexa's accidental murder? Oh, hey! Look who it is (finally)! 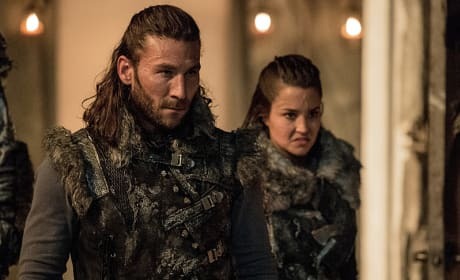 Roan, the king of the Ice Nation, and Ontari, the Nightblood right hand woman of the late Queen Nia, Roan's recently deceased mother. 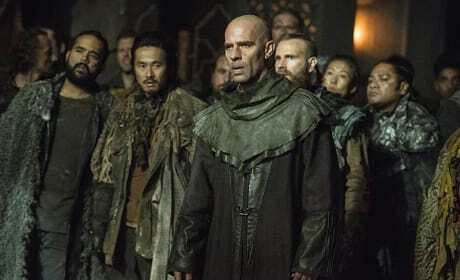 Odds are they've arrived in Polis for the ascension in which the next Commander is "chosen." 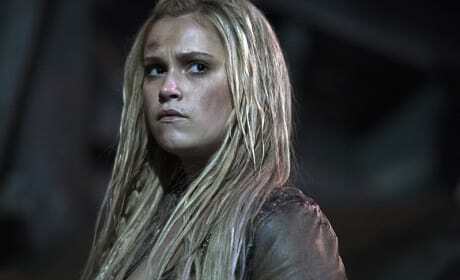 Clarke looks a bit surprised to see someone, as Lexa's body lay in the background. 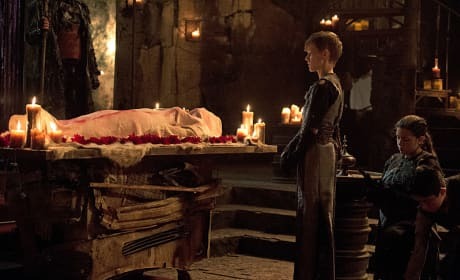 We don't really know what the Grounders call the ceremony in which the body of a previous Commander is laid to rest, so for our purposes let's call it Heda's funeral. It's interesting that Murphy, of all people, is the one who's wound up there next to Clarke -- her only support in Polis. 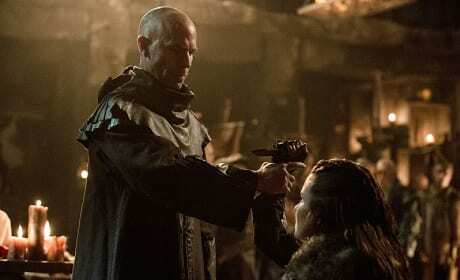 Aden, Lexa's most promising Nightblood initiate, stands over the body of the fallen Commander. Will he be taking her place, as Lexa had assumed? Octavia appears to have made her way back to Arkadia, after Clarke failed to meet up with her to head home from Polis. Are she and Indra plotting an attack on Pike and his followers? Harper seems to be up to something. Are Harper and Miller planning a rescue for Kane? Bellamy chose not to turn them in, so in all likelihood, they haven't been imprisoned (yet, at least). 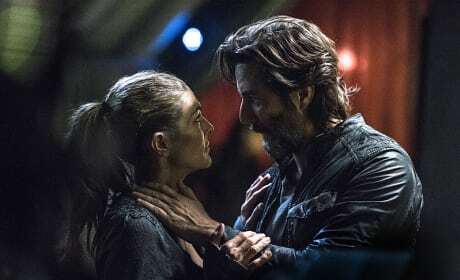 Kane and Abby share a close moment while Kane is on death row. Permalink: May we meet again.